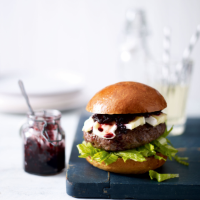 Juicy burgers topped with a lovely combination of Camembert and a piquant beetroot relish make the ideal dish for feeding friends. gentle heat until the sugar has dissolved. Increase the heat and simmer for 12–15 minutes, or until almost all of the liquid has evaporated. Set aside to cool slightly. 2. Preheat the grill to high. Put the burgers on a rack set over a foil-lined grill pan and grill for 11–15 minutes, turning halfway through until nicely browned and thoroughly cooked through with no pink meat. Halve the brioche buns and toast the cut sides until golden. 3. Divide the lettuce between the base of the buns and lay the burgers on top. Place some Camembert on the burgers, spoon over the relish and top with the buns. Serve with extra beetroot relish on the side. Cook's tipThe beetroot relish will keep in a covered container in the fridge for a week if you want to make it ahead of time.